This white paper is written for nance professionals who are considering investment in accounts payable (AP) automation software for Microsoft Dynamics® AX. It will discuss best practices, provide an overview of AX AP functionality, discuss software that can extend AX to deliver the desired best practices and provide an overview of the Kofax® AP AgilityTM accounts payable automation solution for AX. The stakeholder engagement paradigm has changed. Not only are organizations communicating with customers, suppliers, partners, and other constituents through additional channels, but the dynamics of those communications have been altered. The relationship itself is gaining value and is increasingly dependent on immediacy, transparency, and bidirectional communication via the preferred medium. At the same time, enterprises continue to focus efforts on improving the productivity of their line-of-business knowledge workers in order to reduce the time they spend on an activity and to improve the quality and reliability of the decisions they make. Because these activities and decisions play a key role in the stakeholder relationship and ultimate business outcomes, strategies to streamline communication processes and perfect key data exchanges are essential. Organizations frequently turn to business process automation to reduce cycle time and error rates. However, many processes still result in a significant number of exception situations that require manual handling by line-of-business workers. In addition, exception resolution may require workers to reach back to customers or other stakeholders, essentially restarting the process from the beginning, resulting in frustration and inefficiency on all sides. The solution is a tightly integrated system that extends between where the stakeholder request originates and where the decision-making systems begin. The system must be able to accurately extract critical data from documents submitted via multiple channels with minimal or no stakeholder intervention. Furthermore, it must be able to consistently perfect documents and data before they are entered into the proper systems of record for high-value/high-cost decision-making processes. Every day, organizations receive high volumes of various types of documents from different channels that launch or continue internal business processes. Reviewing and interpreting these documents, entering data from them, and forwarding them on to others for further processing consumes company time and resources, which increases operating costs and negatively impacts customer and supplier responsiveness. A digital mailroom powered by enterprise-level capture and business process management (BPM) technology solves these problems by converting incoming documents—whether originating from mail, fax, email, multi-function peripherals (MFPs), web portals, or mobile devices and tablets—into structured electronic information that feeds multiple business processes and systems across the enterprise. In almost every organization there are accounting, human resources, purchasing, contract management and customer service processes. In addition, there are vertical market-special processes, such as insurance claims processing, mortgage processing, electronic health records management, new bank account opening, case management in government, and so on. Business process management (BPM) and dynamic case management (DCM) are used to orchestrate and automate the complex sequence of steps required to complete these processes, and these processes frequently require the capture of incoming business documents as part of the process. Smart capture solutions capture and streamline the flow of business critical information throughout an organization in a more accurate, timely and cost effective manner. This white paper overviews how Smart capture can transform traditional incoming document reception and processing into an efficient ”digital mailroom” that helps organizations reduce costs, drive process efficiency, and improve customer service and market competitiveness to better grow their businesses. as an important step toward a new DMS: a document management system for the administration, preservation, storage and retrieval of documents within the organization. According to Bellekom, the new DMS is part of the broad front of ce that municipalities currently have or plan to build. The front of the organization is composed of a website with electronic forms, a call center (Client Contact Center) and a mailroom where, in the case of Gouda, about 140,000 items come in annually. The items have to be sorted and opened regardless,” said Bellekorn. “They might be complaints, letters, application forms or opinions. Employees read and assess the contents, then register and classify the content using their experience, thereby setting the processes of the organization in motion. That work can be automated. For example, we already have experience with the digitalization of incoming invoices and Social Services documents. This expertise can now be used with the implementation of the digital mailroom. While increasing sales is a natural goal for improving the bottom line, significant revenue can be found by optimizing AP automation. Improving workflows at every key milestone reduces costs of manual intervention, all while increasing early payment discounts. Below are ways your organization can implement best-in-class AP practices. A modern financial system is the foundation for automation. Complete accounts payable automation solutions are a relatively new product category for financial operations professionals. Advanced technologies such as mobile, social networking, and intelligent dashboards are very slowly being integrated into offerings and adopted by enterprises. Finance professionals are cautious by nature and do not always view AP automation solutions as being strategic to an enterprise. However, in the past 10 to 15 years, companies have automated components of their AP process, doing it in phases with a slow adoption rate. Let’s look at the current phases for incorporating an automated solution into AP systems, as well as the current state of adoption, and predictions about where the industry is headed. Electronic signatures, or e-signatures, have become a standard part of many business processes today. When deployed across mobile and traditional devices, e-signature technology significantly improves your organization’s efficiency resulting in a better customer experience. In this three-part blog series, we’ll discuss how deploying e-signature technology across your entire organisation benefits your bottom line by boosting productivity, driving customer engagement and enriching the customer experience with omni-channel availability. While the term “operational excellence” can vary in meaning depending on the organisation, when businesses gather metrics from key performance indicators (KPIs) to their descriptions of operational excellence, real progress is made. Whatever the definition, the most-cited goal of achieving operational excellence is to exceed customers’ expectations with every transaction, every day. As management guru Peter F. Drucker asserted, “The purpose of business is to create and keep a customer.” E-signature technology can help your organisation become more efficient with friction-free, fluid processes that enhance the customer experience, enabling you to create and keep them. The right e-signature technology improves the operational efficiency of your organization in part because of the ubiquity of transactions, which require signatures. From onboarding a new customer and opening an account to completing a loan application and more, signatures are required to complete many transactions. 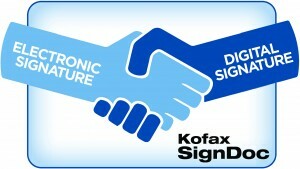 The signature captures your customers’ intent and signifies that they have agreed to the presented terms and conditions. Customers accept the need for the process and value the implied security, but there is no denying that the traditional paper-based process can be cumbersome. In addition to delivering a less than ideal customer experience, paper-based processes slow down business, costing time and productivity. Faster customer acquisition: Workflows streamlined by the adoption of e-signature technology result in a more efficient customer turnaround time and reduce the risk of cancellation. Cost reduction: Implementing a paperless process reduces the following expenditures: cost of paper products, courier and shipping charges and storage. Straight-through processing: The 100 percent digital process removes the time-consuming task of re-keying information and eliminates data entry errors. Easy retrieval and archiving: E-signed documents are archived automatically and retrieved easily when needed. Customer-friendly process: Electronically signing on a mobile device such as a smartphone or tablet offers an easy and technically familiar process that customers trust. E-signature technology helps your organization become more efficient with friction-free, fluid processes, enriching the customer experience and increasing customer retention. More companies, across a variety of industries are embracing e-signature technology as an opportunity to transform the customer experience. However, in a move to reduce operating costs, too many organizations are relying heavily on automated interactions. But reducing or obscuring in-person transactions can degrade the sales experience, sometimes even prompting customers to move to a competitor. Use digital to augment – not only replace – your face-to-face transactions. How do you “go digital” without losing the personal touch? Leveraging e-signature technology makes digital transactions personal, and serves your clients anywhere, anytime, and on their preferred device. Business customers are savvier than ever before and expect certain transparency at each stage of the buying cycle and beyond. 1. Ease of Use – Select an e-signature solution that allows your customers to use self-service technology at their own pace, such as allowing them to review documents before signing or completing the workflow without installing additional software. 2. Device-friendly – Customers expect transactions to be secure and accessible from any web-enabled device (computer, tablet or smartphone) at any time. 3. Security first – E-signing isn’t new. Customers should find it natural to transition to a digital process. However, organisations must be able to create tamper-evident documents. Being able to produce an audit trail of electronic evidence that demonstrates the signer understood and accepted contract conditions at the time of e-signing, builds trust with customers. And improves your sales efficiency. 4. 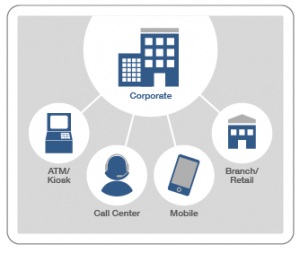 More interactive assisted process –Using in-branch devices such as tablets, that can be handed back and forth with the customer is an example of a collaborative transactional process. It’s a guiding example of ways leading e-signature technology can deepen and improve customer interactions. 5. “Traffic Light” Navigation – Digital transaction processes that include your employee or end customer to complete one step before they move to the next help to reinforce consistent sales interactions from sales and customer service teams. Maximise sales effectiveness and maintain your competitive edge, enrich – don’t just replace – in-person customer experiences with efficient digital processes. Customers expect a seamless, consistent experience across all channels, supporting the case for implementing e-signature technology across your enterprise. Not only do e-signatures play a pivotal role in digital transaction management, they are also an important factor when delivering a unified omni-channel experience to customers. Part of this comprehensive, omni-channel approach is e-signatures. Asking your customer to leave the digital world to sign with wet ink is like asking them to leave your brick-and-mortar location and come back another day to make a purchase – an irritating hurdle interrupting an otherwise smooth transaction. Enterprise-wide digital management technology avoids gaps in customer service and helps correct inconsistent or cumbersome processes. The e-signing process and the user interface should be similar, whether the customer is signing online or in-branch. 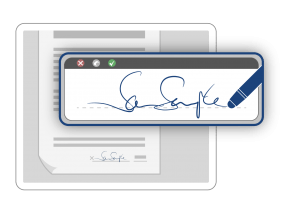 Support for multiple signature types keeps the process digital. 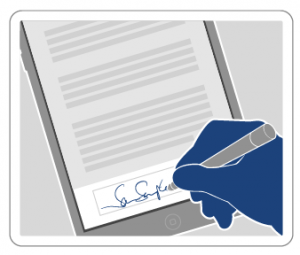 Offer your customers the ability to apply handwritten e-signatures on a mobile device or click “I Agree” to e-sign. In other words, remove friction from the process by providing a number of e-signing options. If you have read this complete blog series, you are undoubtedly committed to building a better customer engagement model and questioning how to achieve optimal efficiency and sales effectiveness in this digital era. A personalized and consistent user experience is the foundation for your omni-channel strategy, and e-signature technology is the adhesive that keeps your process digital. When you embark on an e-signature project, you’ll have a long list of requirements. The following questions will likely be top of mind: Are the resulting e-signatures legal. Can I easily integrate the solution within my infrastructure? Do I need an on premise, or a cloud solution? These are all important considerations. Validating an e-signature’s integrity is critical, now and in the future. The ability to analyze a document and determine whether or not it has been tampered with, makes using e-signing technology arguably more secure than a traditional pen-on-paper process. If you can’t perform that kind of analysis, the solution will eventually lose much of its value. Before I dive into the importance of standards, let’s step back, and explain the value of e-signing versus a paper process – the key is the ability to confirm the integrity of the document, at any time. Applying a wet ink signature onto a piece of paper places a representation of your signature onto that document. There are no mechanisms in place to prevent someone from adding or modifying existing text within the document. The document itself can be easily tampered with after the signing takes place. Even the signature itself can be manually copied and placed at different locations within a document. An analogous issue can be inherent in an electronic signing solution, too. Solutions that insert a pure image of your signature into a document – instead of a real standards-based electronic signature – suffer exactly the same disadvantages as the traditional paper-based process described above. Specifically, the signature can be easily copied, tampered with, and reused and you have no way to detect this has occurred. Obviously, this defeats the purpose and is not desirable. What you need is a solution that is safer and more secure than the traditional paper process. Optimally, an electronic signing solution should make it obvious the document was tampered with. If you are using e-signatures, but cannot guarantee the integrity of the document, you are missing one of the key benefits and advantages of using e-signing as opposed to wet ink paper signing (besides the obvious efficiency and cost benefits). Although most e-sign solutions guarantee the integrity of their signed documents, many don’t guarantee it in a standards-based manner. I’ll argue that by relying on such solutions, you run the risk of being left with a database full of non-verifiable documents. This is because you will be dependent on your solution provider for signature validation. So how can we resolve this issue? To me the solution is obvious, the consequent use of standards for the electronic signatures that you place into valuable documents and contracts. The ISO standard will solve your long-term e-sign validation issues. The Portable Document Format (PDF) is specified as a digital form for representing documents in the ISO 32000-1 standard. This format enables users to exchange and view electronic documents easily and reliably. The ISO 32000-1 standard identifies the ways in which an electronic signature, in the form of a digital signature, may be incorporated into a PDF document to validate the integrity of the document’s content. The use of electronic signatures for PDF documents following ISO 32000-1 is specified in “Electronic Signatures and Infrastructures (ESI); PDF Advanced Electronic Signature Profiles” (ETSI TS 102 778). Your e-signature solution should supports the ISO 32000-1 standard. 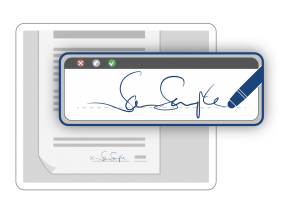 As a result, any document e-signed using a handwritten, biometric, or click-to-sign signature, can be validated with any standard, compliant PDF Reader. Not only can your organization validate electronic signatures independently, but your own customers will also appreciate the ability to validate their copy of the e-signed PDF as well. The use of proprietary software that locks you into one particular vendor is a thing of the past. Demand support for ISO 32000-1 and ensure your e-signed documents can be validated, anytime, without locking you into a solution – or, worst, locking you out of your e-signed documents. Efficiency Leaders can help you transform your organisation with our range of superior products, innovative solutions and capability for seamless integration. Let's talk!